After installing the mods and ENB settings, some changes need to be made before Skyrim can be launched. If you start Skyrim before making these changes, the game will most likely not even start, and if it does, will not be able to load or start a new game. With the exception of number 1, these changes are absolutely necessary for Skyrim to work after modding. Having a fast and stable system is absolutely necessary to run a heavily modded Skyrim. If you have a high-end system, you should have nothing to worry about, even with all mods installed. But if you have a semi-old or medium-spec system, it will be put to the test. Skyrim needs the best possible conditions to perform. If you already have a fast and stable system, just skip to number 2. Cleaning/optimizing Windows is of course a huge subject, so I will not go into details, but rather give suggestions about what to look out for. This is written for Windows 7 x64, but most things apply to XP/Vista/Win8/Win10 (32/64bit) as well. 2: Have as few unnecessary programs running in the background as possible. Preferably non. 3: Never have real-time anti-virus programs running. 99% of anti-virus software can and will significantly slow down any computer, all while doing an extraordinarily poor job at protecting against viruses. The best way to protect your computer against mal-ware and viruses, is by having a great firewall, preferably at router level, so nothing gets to the computer in the first place. 4: If you use a software firewall on your computer (Not all routers have great firewalls), then use one that doesn't require a lot of resources. Also turn off the useless built-in Windows firewall & services. (Except on Win10, as the firewall "service" is required to run in the background at all times, or the AppStore won't work. I can recommend Comodo Firewall. It's free and can be customized to use very little resources while doing a pretty decent job. 5: Get rid of junk-driver-programs. Keep the drivers of course, but uninstall or disable all the useless services that constantly run in the background. Like scanner, printer or audio "service" programs that comes with the drivers. 6: Get rid of junk-apps. Weather apps, search bars and joke apps etc., They use your connection to bring you useless commercials and junk, which takes up recourses. 7: Get rid of PunkBuster, if you have it. Go to services, and check if "PnkBstrA" and/or "PnkBstrB" are running. If they are, stop and disable them. (Control Panel -> Administrative Tools -> Services) *If you use Comodo Firewall, you can block PunkBuster from ever being installed again, and prohibit execution of any PunkBuster services. You would be surprised how many games that silently install this junk program, so it's a good idea to check, even if you never installed PunkBuster yourself. 8: Clean the temp-files. I can recommend CClean. It's free, and comes in both 32bit and 64bit versions. 11: Never ever use iTunes. Besides being the slowest, most incompatible, ugly, and absolute worst media player ever made, it will also decrease performance on any system, and runs the weirdest background "services" at random. Stay away from any Apple products. No offence to Apple-users, but Apple is not capable of writing quality software. 12-2: Disable the worst Microsoft services. Like: Application Experience, Background Intelligent Transfer Service, IP Helper, Internet Connection Sharing (Unless you actually use it), Media Center Extender Service, Office Source Engine, Offline Files, Program Compatibility Assistant Service, Remote Registry, Routing and Remote Access, Superfetch, Tablet PC Input Service, Windows Firewall (Most useless firewall ever made), Windows Media Center Receiver Service, Windows Media Center Scheduler Service, Windows Media Player Network Sharing Service, Windows Search (This has nothing to do with "Search", it's just another name for the horrible "indexing service"). 14: Always have the latest graphics card drivers installed. Don't use the ones from Windows update. Go to the manufactures website and download the latest drivers specifically for your card. 15: Update Direct-X, XNA Framework, Visual C++ Redistributables and .NET Framework. All these can be found at the Microsoft Download Center. This is for nVidia drivers. If you use ATI/AMD or Intel graphic card, you might want to Google how to obtain the same settings. Open up the nVidia Control Panel, and go to "Manage 3D settings". Then click the "Program Settings" tab, and add the "skse_loader.exe". Antialiasing - Transparency (Off) *ENB has it's own AA settings. If you enable the driver AA, ENB will be disabled completely. Threaded Optimization (On) *If you DON'T have a multi-core CPU, set this: "Off"
Vertical sync (On) *If you prefer higher FPS instead of tear-free smooth game-play, set this: "Off"
*If you use ATI/AMD or Intel graphics, go to the Skyrim game folder and open up "enblocal.ini" with a notepad and change "FixParallaxBugs=true" to "FixParallaxBugs=false". Info: The load-order is a list that determines in which order Skyrim loads additional content (mods). The load-order has 255 slots which are loaded into the memory one by one in the exact order they are listed, top to bottom. If identical data appears (If two mods contain data in the same records), then the last mod (furthest down), overwrites whatever came before. Also, if a mod has references to another mod, this other mod HAS to be listed in the load-order before the mod with the dependency. If a mod is depending on something that is missing or listed later in the load-order, Skyrim will either not load those mods, load them with errors, or not even start. Besides dependencies, some mods also edit the same data, and the load-order dictates which data takes priority. These "conflicts" can cause all kind of errors if the mods are not placed correctly. Having a correct load-order is absolutely necessary for the game to work. The list below is how a correct load-order with all SBP recommended mods looks like. If you didn't install all mods, but lets say, only installed the ones without a colored square, then you won't find all these items in your own load-order. Whenever an item is "missing", just skip it, but keep everything else in the exact same order from top to bottom. Note: DON'T use Loot. I know it's tempting to have a program sort the whole thing, but Loot isn't able to do a good enough job, sorry. You can of course start by sorting with Loot, but then you NEED to correct the load-order yourself afterwards. Some settings in Skyrim cannot be set via the regular settings menu or the launcher. The default available settings are actually VERY limited compared to the amount of actual settings. All of these settings are stored in two files. "Skyrim.ini" and "SkyrimPrefs.ini". Some of these settings can bring much better quality to the game, also, some mods require certain settings to be set for them to work as intended. The ini files are usually located here: "C:\Users\(USERNAME)\Documents\My Games\Skyrim\". [Grass] *These settings are necessary for both "Skyrim Flora Overhaul" & "Grass on Steroids"
[Grass] *These settings are necessary for "Skyrim Flora Overhaul" & "Grass on Steroids"
Info: Because new NPCs have been added to Skyrim, the FNIS tool (GenerateFNISforUsers.exe) from "Fores New Idles in Skyrim - FNIS" needs to be run. FNIS is needed to provide animation info for any NPC in the game. If Skyrim doesn't get this information, any new or changed NPC will not be animated. 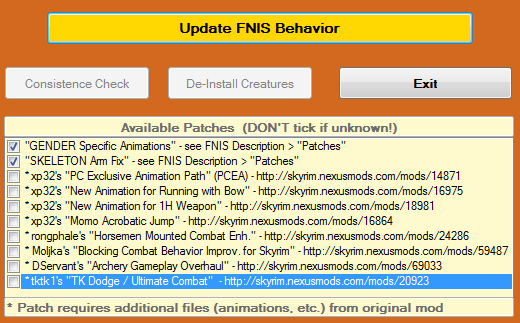 This means, that after ANY changes (Adding/Removing mods containing NPCs or mannequins), this tool HAS to be run. If you haven't already done so, then create a shortcut to the tool. Go to the Skyrim game folder, then open "\Data\tools\GenerateFNIS_for_Users\" and make a shortcut to "GenerateFNISforUsers.exe"
When the tool has run it's process, click "Consistence Check". When that is done, click "Exit"
In order to use the Skyrim Script Extender (SKSE), Skyrim needs to be launched via the SKSE launcher instead of the original Skyrim launcher. If you haven't done so already, open up the Skyrim game folder, and make a desktop shortcut to "skse_loader.exe". Use this shortcut to start Skyrim from now on. *Just don't start Skyrim yet.